If you want to plunge into the world of courtly life, love and even lavatories, you’re in the right place. Although the wider Hofburg is now split into numerous separate institutions, your first address should be what visitors would probably regard as “the” Hofburg attraction, composed of the Silberkammer, Sisi Museum and Kaiserappartements. The Imperial silver collection, which despite its name also features a wide range of porcelain and household items from Imperial times. Not the sort of items you’ll find in your nearest supermarket, mind. The clothes, personal possessions and biography of Sisi (Empress Elisabeth), the famous wife of Emperor Franz Joseph. The Imperial apartments, where you can see where the Imperial couple worked, slept, bathed and exercised. At the time of writing, basic admission cost €12.50 for an adult, with the usual reductions. That price includes an audio guide and Vienna Pass* holders get in free. The Hofburg is open every day of the year from 9am to 5.30pm (until 6pm in July and August). Needless to say, do check the official website for current opening times, prices and ticket options. If you’re going all Imperial, then buy the value-for-money combination ticket that also gets you into the Schönbrunn Palace Grand Tour and the Hofmobiliendepot (Imperial furniture museum). Get there early. I visited on a March Saturday and it was already busy – particularly the Sisi Museum which has some narrow passages in it. The Sisi Museum and Imperial apartments are all-in-one, but there are separate ticket controls for the Silberkammer. So you can take a break between the two. It took me four hours to get round all three areas, listening to just about everything on the audio guide and reading almost every written information. So you can probably get round in half that time. (I may have skipped a few porcelain plates at some point, but in my defence there are a lot of them). Display labels and information are all in English and German. The audio guide provides interesting background information and little bonus bits of trivia. The numbers to plug into your audio guide are always in large print with a picture of the device next to it. The smaller numbers in the display cabinets are for the index cards somewhere near that tell you what you’re looking at. So is it worth it if you’re not a big fan of plates and princesses? I think so. Elisabeth and Franz Joseph are interesting characters, for example, and the contrasts between the two provide an intriguing background to your visit. And even if you care little for the history or origin of the items on display, you do get a good, big-picture impression of Imperial life. And insights into the crushing pressures of sitting on top of the social and political ladder, the almost-depressing extravagance of court and the tragically all-too-human weaknesses of those who would set themselves apart from the rest of us. 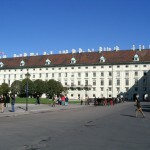 The Hofburg is a big place, largely free of vehicles. So you may have a short walk from all these public transport stops. But since that walk likely takes you through the wonderful Hofburg complex, that might be a good thing.